Scientoonics is a new discipline in science that deals with science communication by using a novel class of science cartoons called scientoons. These are essentially cartoons based on scientific concepts, discoveries, results, and their applications. The present book is an effort with entirely novel approach in communication of scientific facts in their true perspective. It will not only help the common man to acquaint himself with the scientific jargon but also make him understand how best we can make use of such facts in our day-to-day life. Recent advances in scientific research, in fact, demand pro-active efforts from the scientists so that complex ideas reach to the people effectively. The present book has essentially tried, through Scientoons, to depict present concerns brought forward by the recent explosion of knowledge, especially the knowledge about Human Genome and related areas. This collection of scientoons has addressed areas such as DNA, DNA fingerprinting, Human Genome, Conservation of Wildlife, etc. Each scientoon is therefore associated with a text that narrates the serious part of the science or its applications. This book is an endeavor to reduce the gap between the excitement of some of the scientific advances in science of the present time and the curious readers who want to know more about science. 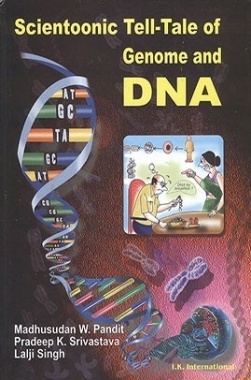 The book has been designed for under-graduates, post-graduates and technicians who wish to know and use the principles and techniques of Recombinant DNA Technology. 1.The book has six chapters and deals with the human genome project and consequences, genes and diseases, DNA fingerprinting and conservation of endangered species. 2.The subject matter explained with Scientoons a novel way of communicating science to the lay person using cartoons. 3.The book has an inspirational postlogue. 4.DNA Fingerprinting –What? and How?